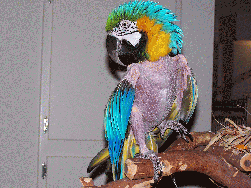 I`m Harlee the Blue and Gold macaw. I lived the first happy 14 years of my life as part of a nice family who loved me and took me for lots of fun rides in the car. But, the economic downturn was very hard on my people. They lost their house. And, they lost me. I got really uneasy about moving and isolation, so I figured the best way to feel better was to pull out a bunch of my feathers. But, now I know that all I need is another good family (or person) who can play with me and look out for my needs. Then I won`t want to pluck anymore. I`m easy to handle, stepping right up to be next to you, which is what I like best. . I like shoulders and as much cuddling as you can offer. I can even say "Hi, Harlee". But, that`s kind of silly, saying "Hi" to myself. I`d like to learn YOUR name and learn to say "Hi" to you!